Artist’s rendering of the future view from 30th Street looking at the planned Drexel Square parks. A committee of City Council on Tuesday approved the first phase of Schuylkill Yards, the 14-acre project in West Philadelphia planned by Drexel University and Brandywine Realty Trust, though the developers have yet to reach an agreement with community groups on minimizing the impact to the adjacent neighborhoods. The developers and community groups are at odds over how much the developers will give to build affordable housing in surrounding neighborhoods, primarily Mantua and Powelton Village. Jerry Sweeney, Brandywine's president and chief executive officer, said Brandywine has committed $2.1 million while the neighborhood groups are asking for more than four times that. 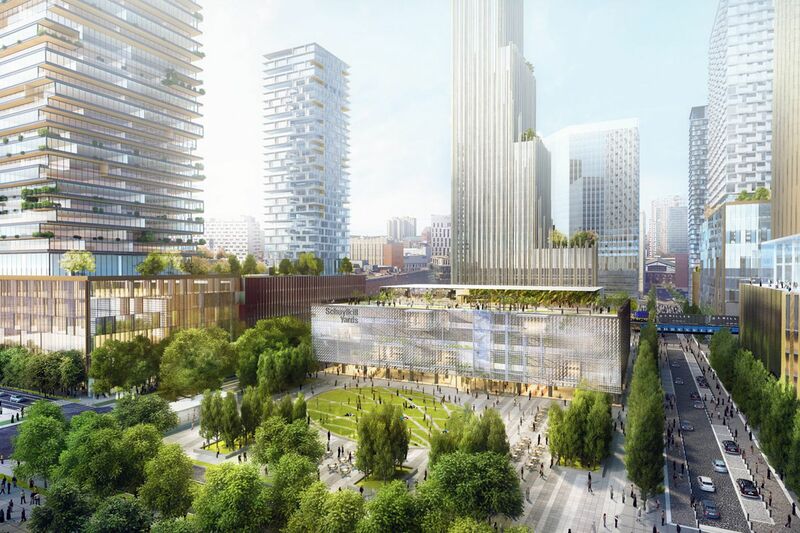 "One of the dividing lines is the community groups are very focused on the overall impact of the entire Schuylkill Yards Development, which will again take place over 20 to 30 years," Sweeney said. "We're very focused on … the first phase." The project will be a dense mix of retail, residences, offices, and labs. The first phase includes the creation of a 1.3-acre park, the renovation of the former Philadelphia Bulletin building at 3025 Market St., and further design and development work. Community members who testified at Tuesday's hearing said buzz about the project has already led to increased interest in nearby neighborhoods, causing housing pressure that will only get worse. "The proponents of Schuylkill Yards are here telling you this is going to be a fantastic, amazing, and wonderful project," said Paul Boni, a lawyer representing several neighborhood groups. "And I think the community benefits aspect of it should also have those words attached to it." Despite the disagreements, Councilwoman Jannie Blackwell, whose district includes the project, recommended the bill for approval Tuesday. Councilman Bill Greenlee, chairman of the committee that considered the bill Tuesday, said that after more than a year of negotiations Blackwell believed it was time to "start to move on." A lawyer for Brandywine said Blackwell has asked the developers and the civic associations to reach an agreement before the legislation comes up for a final vote, which could be as early as June 22. After Tuesday's hearing, staff from Council President Darrell L. Clarke's office were attempting to mediate those negotiations.